Montreal, Canada, October 4, 2012 – Presagia announced today valuable new features that will significantly enhance how its customers can manage their athletes’ health. Presagia Sports, an Athlete Electronic Health Record (EHR) system used by amateur and professional sports teams and organizations across the globe, now includes the SCAT2 concussion assessment tool, treatment planning, and expanded capabilities for managing medications. In the wake of the current National Football League (NFL) “master complaint” lawsuit, involving nearly 3,400 players, concussions have been thrust into media headlines and into discussions about improving athlete health management. Thirty-nine states in the U.S. have implemented concussion legislation to safeguard amateur and professional athletes. Presagia, a leading developer of software solutions for sports medicine offers the cloud-based Presagia Sports on a Software as a Service (SaaS) basis. 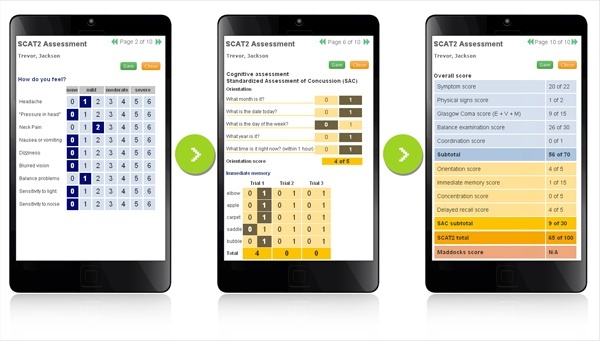 As a testament to how closely Presagia listens to its users, the Presagia Sports mobile version now includes the widely used SCAT2 concussion assessment tool. With Presagia’s mobile SCAT2, medical professionals diagnosing concussions are guided step by step through the SCAT2 on their smartphones or tablets. The system provides automatic calculations and a built-in timer to facilitate secure, rapid, and accurate evaluations. Baseline tests can be captured and all scores are summarized in a single view so that medical professionals can easily compare the most recent concussion assessment to previous assessments and baseline scores. The system also produces a concussion injury advice document at the end of each evaluation to be provided to the athlete or those responsible for them. Treatment planning is another new feature that Presagia has brought online today. This feature can change how athlete health is managed - rather than simply recording a treatment after it’s happened, the treatment planning feature allows athletic trainers and other medical professionals to be more proactive and easily plan rehab and other activities in advance to ensure that athletes receive the best possible care. Another enhancement that Presagia introduced today is an expanded capability to track the medications that each athlete is taking. This includes the dispensing and prescribing of drugs, as well as the dispensing of over the counter medications. All of this can be recorded and referenced in the web application and mobile version. The medication data can also be analyzed via the system’s reporting tools, to obtain statistics and expose trends. The medication management features nicely compliment the system’s integrated SCAT2 capability. For instance, after an athlete sustains a concussion, they should not take certain types of medications such as paracetamol, codeine, aspirin or anti-inflammatories. Presagia Sports makes it easy for a user diagnosing a concussion to quickly see the medications an athlete is taking and alert other members of the medical team about the concussion. Presagia provides secure web-based health management software solutions used by athletics organizations worldwide. Presagia Sports is a multi-sport Athlete Electronic Health Record (EHR) and injury management system that centralizes information needed by athletic trainers, physicians, coaches and physiotherapists while streamlining data entry. It also includes real-time reporting and collaboration tools. Presagia customers include the World Anti-Doping Agency, the U.S. Ski and Snowboard Association, the English Institute of Sport and the Irish Sport Council.